The 909 has 3 tom toms: Low tom, mid tom and hi tom. Each tom has a tune knob (changes the pitch of the tom) and a decay knob (changes the length of the tom). The tom toms where sampled with the tune knobs at semitone positions. It is possible to play tom tom melodies. One octave of each tom. Keyswitches change the decay of all toms. 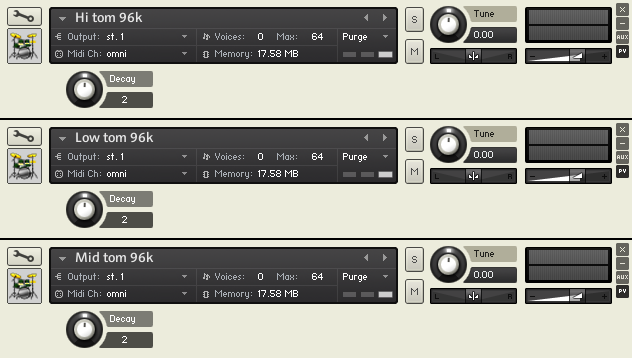 Use the multi output EXS24 instrument to have each tom at separate outputs. This is a "multi instrument" that loads one instrument for each tom. You can set the level, pan and output for each tom. The 3 tom instruments are also available separately: "S909 Tom toms low", "S909 Tom toms mid" and "S909 Tom toms hi". C1 Decay 0 Keyswitches: Changes the decay of all 3 toms.